2005-04-12 Assigned to MOLECULAR IMPRINTS, INC. reassignment MOLECULAR IMPRINTS, INC. ASSIGNMENT OF ASSIGNORS INTEREST (SEE DOCUMENT FOR DETAILS). Assignors: WATTS, MICHAEL P. C., FLETCHER, EDWARD B., LAD, PANKAJ B., XU, FRANK Y. The present invention includes a method of solidifying a polymerizable liquid to form a film on a substrate that features minimizing inhibition of the polymerization process by oxygen contained in the atmosphere surrounding the polymerizable liquid. To that end, the polymerizable liquid includes, inter alia, an initiator that consumes oxygen that interacts with the polymerizable liquid and generates additional free radicals to facilitate the polymerization process. The field of invention relates generally to micro-fabrication of structures. More particularly, the present invention is directed to a polymerization technique suited for use in imprint lithography. An exemplary micro-fabrication technique is commonly referred to as imprint lithography and is described in detailed in numerous publications, such as United States published patent applications 2004/0065976 entitled METHOD AND A MOLD TO ARRANGE FEATURES ON A SUBSTRATE TO REPLICATE FEATURES HAVING MINIMAL DIMENSIONAL VARIABILITY, 2004/0065252, entitled METHOD OF FORMING A LAYER ON A SUBSTRATE TO FACILITATE FABRICATION OF METROLOGY STANDARDS, 2004/0046271, entitled METHOD AND A MOLD TO ARRANGE FEATURES ON A SUBSTRATE TO REPLICATE FEATURES HAVING MINIMAL DIMENSIONAL VARIABILITY, all of which are assigned to the assignee of the present invention. The fundamental imprint lithography technique as shown in each of the aforementioned published patent applications includes formation of a relief pattern in a polymerizable layer and transferring the relief image into an underlying substrate forming a relief image in a structure. To that end, a template is employed spaced-apart from a substrate, with a formable liquid present between the template and the substrate. The liquid is solidified forming a solidified layer that has a pattern recorded therein that is conforming to a shape of the surface of the template in contact with the liquid. The substrate and the solidified layer are then subjected to processes to transfer, into the substrate, a relief structure that corresponds to the pattern in the solidified layer. On manner in which the polymerizable liquid is located between the template and the substrate is by depositing a plurality of droplets of liquid on the substrate. Thereafter, contact is made with the polymerizable liquid by the template to spread the polyermizable liquid over the surface of the substrate and subsequently record a pattern therein. It is highly desirable to avoid trapping of gases, such as air, when the polymerizable liquid spreads over the substrate. It is desired, therefore, to provide a method for forming a fluid layer on a substrate while minimizing the trapping of gases therein. The present invention includes a method of solidifying a polymerizable liquid to form a film on a substrate that features minimizing inhibition of the polymerization process by oxygen contained in the atmosphere surrounding the polymerizable liquid. To that end, the polyermizable liquid includes, inter alia, an initiator or additive that consumes oxygen that interacts with the polyermizable liquid and generates additional free radicals to facilitate the polyermization process. Specifically, the method includes creating a primary group of free radicals by exposing the polymerizable liquid to actinic radiation to initiate linking together of a plurality of molecules. A secondary group of free radicals is generated by interaction of molecules of an atmosphere surrounding the liquid by a subset of the free radicals of the primary group. A tertiary group of free radicals is generated by interaction of the plurality of molecules with the free radicals of the secondary group to link together additional molecules of the plurality of molecules. These and other embodiments are discussed more fully below. FIG. 8 is a cross-section view showing a release layer applied to a planarization mold. FIG. 1 depicts a lithographic system 10 in accordance with one embodiment of the present invention that includes a pair of spaced-apart bridge supports 12 having a bridge 14 and a stage support 16 extending therebetween. Bridge 14 and stage support 16 are spaced-apart. Coupled to bridge 14 is an imprint head 18, which extends from bridge 14 toward stage support 16. Disposed upon stage support 16 to face imprint head 18 is a motion stage 20. Motion stage 20 is configured to move with respect to stage support 16 along X and Y axes and may provide movement along the Z axis as well. A radiation source 22 is coupled to system 10 to impinge actinic radiation upon motion stage 20. As shown, radiation source 22 is coupled to bridge 14 and includes a power generator 23 connected to radiation source 22. Referring to both FIGS. 1 and 2, connected to imprint head 18 is a template 24 having a mold 26 thereon, which may define a smooth or planar surface of have a pattern formed therein. As shown, mold 26 includes a pattern having a plurality of features defined by a plurality of spaced-apart recesses 28 and projections 30. Projections 30 have a width W1, and recesses 28 have a width W2, both of which are measured in a direction that extends transversely to the Z axis. The plurality of features defines an original pattern that forms the basis of a pattern to be transferred into a substrate 32 positioned on motion stage 20. To that end, imprint head 18 is adapted to move along the Z axis and vary a distance “d” between mold 26 and substrate 32. Alternatively, or in conjunction with imprint head 18, motion stage 20 may move template 24 along the Z-axis. In this manner, the features on mold 26 may be imprinted into a flowable region of substrate 32, discussed more fully below. Radiation source 22 is located so that mold 26 is positioned between radiation source 22 and substrate 32, with actinic radiation generated by radiation source 22 propagating through mold 26. As a result, it is desired that mold 26 be fabricated from material that is substantially transparent to the actinic radiation. Exemplary materials from which mold 26 may be fabricated include fused-silica, quartz, silicon, organic polymers, siloxane polymers, borosilicate glass, fluorocarbon polymers, metal, and combinations of the above dependent upon the actinic radiation employed. An exemplary system is available under the trade name IMPRIO 100™ from Molecular Imprints, Inc. having a place of business at 1807-C Braker Lane, Suite 100, Austin, Tex. 78758. The system description for the IMPRIO 100™ is available at www.molecularimprints.com and is incorporated herein by reference. Referring to both FIGS. 2 and 3, a flowable region, such as an imprinting layer 34, is formed on a portion of surface 36 that presents a substantially smooth, if not planar, profile of a surface facing mold 26. In one embodiment of the present embodiment, the flowable region is deposited as a plurality of spaced-apart discrete droplets 38 of imprinting material on substrate 32. Specifically, droplets 38 are arranged on surface in a pattern 100 that minimizes trapping of gases when the imprinting material of droplets 38 merge to form a contiguous layer over surface 36, shown more clearly in FIG. 4 as recorded pattern 134. Referring to both FIGS. 2 and 4, the imprinting material may be selectively polymerized and cross-linked to record an inverse of the original pattern therein, defining a recorded pattern 134 that is subsequently solidified as discussed below. The plurality of features on mold 26 are shown as recesses 28 extending along a direction parallel to projections 30 that provide a cross-section of mold 26 with a shape of a battlement. However, recesses 28 and projections 30 may correspond to virtually any feature desired and may be as small as a few tenths of nanometers. Features such as those that facilitate formation of integrated circuits. Referring to both FIGS. 2 and 5, the recorded pattern 134 is produced, in part, by interaction of the imprinting material with mold 26, e.g., mechanical contact, electrical contact and the like. In an exemplary embodiment, distance “d” is reduced to allow imprinting layer 34 to come into mechanical contact with mold 26. In response, the imprinting material in droplets 38 spreads forming a series of intermediate patterns, one of which is shown as pattern 200, to form a contiguous formation of the imprinting material over surface 36. In one embodiment, distance “d” is reduced to allow sub-portions 46 of recorded pattern 134 to ingress into and fill recesses 28. It may be desired to purge the volume, for example with Helium gas flowed at 5 pounds per square inch (psi), defined between mold 26 and both surface 36 and droplets 38 before contact occurs. An exemplary purging technique is disclosed in U.S. patent application Ser. No. 10/677,639 filed Oct. 2, 2003, entitled SINGLE PHASE FLUID IMPRINT LITHOGRAPHY METHOD, which is incorporated by reference herein. In the present embodiment, sub-portions 48 of recorded pattern 134 in superimposition with projections 30 remain after the desired, usually minimum distance “d”, has been reached, leaving sub-portions 46 with a thickness t1, and sub-portions 48 with a thickness, t2. Thickness t2 is referred to as a residual thickness. Thicknesses “t1” and “t2” may be any thickness desired, dependent upon the application. The total volume contained in droplets 38 may be such so as to minimize, or avoid, a quantity of the imprinting material from extending beyond the region of surface 36 in superimposition with mold 26, while obtaining desired thicknesses t1 and t2, i.e., through capillary attraction of the imprinting material with mold 26 and surface 36 and surface adhesion of the imprinting material. Referring again to FIGS. 2 and 3, after a desired distance “d” has been reached, radiation source 22 produces actinic radiation that polymerizes and cross-links the imprinting material, solidifying recorded pattern 134. The composition of imprinting layer 34 transforms from a fluidic imprinting material to a solidified material. This provides solidified imprinting layer 134 with a side having a shape that conforms to a shape of a surface 50 of mold 26, shown more clearly in FIG. 4. As a result, recorded pattern 134 is formed having recessions 52 and protrusions 54. After solidification of recorded pattern 134, distance “d” is increased so that mold 26 and recorded pattern 134 are spaced-apart. Typically, this process is repeated several times to pattern different regions (not shown) of substrate 32, referred to as a step and repeat process. An exemplary step and repeat process is disclosed in published United States patent application No. 2004/0008334, filed Jul. 11, 2002 as application Ser. No. 10/194,414, entitled STEP AND REPEAT IMPRINT LITHOGRAPHY, which assigned to assignee of the present invention and is incorporated by reference. The advantages of this patterning process are manifold. For example, the thickness differential between protrusions 54 and recessions 52 facilitates formation, in substrate 32, of a pattern corresponding to the recorded pattern 134. Specifically, the thickness differential between t1 and t2 of protrusions 54 and recession 52, respectively, results in a greater amount of etch time being required before exposing regions of substrate 32 in superimposition with protrusions 54 compared with the time required for regions of substrate 32 in superimposition with recession 52 being exposed. For a given etching process, therefore, etching will commence sooner in regions of substrate 32 in superimposition with recessions 52 than regions in superimposition with protrusions 54. This facilitates formation of a pattern in substrate corresponding to recorded pattern 134. By properly selecting the imprinting materials and etch chemistries, the relational dimensions between the differing features of the pattern eventually transferred into substrate 32 may be controlled as desired. To that end, it is desired that the etch characteristics of recorded pattern 134, for a given etch chemistry, be substantially uniform. As a result, the characteristics of the imprinting material are important to efficiently pattern substrate 32 in light of the unique patterning process employed. As mentioned above, the imprinting material is deposited on substrate 32 as a plurality of discrete and spaced-apart droplets 38. The combined volume of droplets 38 is such that the imprinting material is distributed appropriately over an area of surface 36 where recorded pattern 134 is to be formed. In this fashion, the total volume of the imprinting material in droplets 38 defines the distance “d”, to be obtained so that the total volume occupied by the imprinting material in the gap defined between mold 26 and the portion of substrate 32 in superimposition therewith once the desired distance “d” is reached is substantially equal to the total volume of the imprinting material in droplets 38. To facilitate the deposition process, it is desired that the imprinting material provide rapid and even spreading of the imprinting material in droplets 38 over surface 36 so that all thicknesses t1 are substantially uniform and all residual thicknesses t2 are substantially uniform. with R1R2 being a surfactant. For purposes of this invention a surfactant is defined as any molecule, one tail of which is hydrophobic. Surfactants may be either fluorine-containing, e.g., include a fluorine chain, or may not include any fluorine in the surfactant molecule structure. In surfactant R1R2, R1═F(CF2CF2)y, with y being in a range of 1 to 7, inclusive, and R2═CH2CH2O(CH2CH2O)XH, with X is in a range of 0 to 15, inclusive. An exemplary surfactant is available under the trade name ZONYL® FSO-100 from DUPONT™. It was believed that during the polymerization reaction the PRIOR ART COMPOSITION formed peroxide radicals proximate to the material-gas boundaries. This slows the rate of, if not prevents, polymerization of the imprinting material. As a result, for a given polymerization process, film 300 is provided with varying degrees of solidification over the volume thereof. where 2-(4-methyl-benzyl)-2-dimethylamino-1-(4-morpholinophenyl)-1-butanone is available from Ciba Specialty Chemicals Corporation of Tarrytown, N.Y. under the trade name IRGACURE® 379. Referring to FIGS. 2 and 7, it may be desirable to provide substrate 32 with a smooth, if not planar, surface upon which to form imprinting layer 34. To that end, substrate 32 may include a primer layer 96. Primer layer 96 has proved beneficial when surface 36 of substrate 32 appears rough when compared to the features dimensions to be formed in imprinting layer 34. Primer layer 96 may also function, inter alia, to provide a standard interface with imprinting layer 34, thereby reducing the need to customize each process to the imprinting material from which substrate 32 is formed. In addition, primer layer 96 may be formed from an organic imprinting material with the same or different etch characteristics as imprinting layer 34. As a result, primer layer 96 is fabricated in such a manner so as to possess a continuous, smooth, relatively defect-free surface that may exhibit excellent adhesion to imprinting layer 34. An exemplary material to use to form primer layer 96 is available from Brewer Science, Inc. of Rolla Mo. under the trade name DUV30J-6. The primer layer 96 is typically provided with a thickness to facilitate providing the desired surface profile and without being opaque to optical sensing equipment employed to detect patterns, such as alignment marks, on substrate 32 surface. Referring to FIGS. 7 and 8, it has been found beneficial to deposit a primer layer 196 when an imprinting layer 34 upon a surface 136 of substrate 32 that has been previously patterned. To that end, primer layer 196, as with primer layer 96, may be deposited employing any known deposition method, including droplet dispense techniques, spin-on techniques and the like. Furthermore, to enhance the smoothness of the surface of either of primer layer 96 and 196 it may be desired to contact the same with a planarization mold 80 having a substantially smooth, if not planar, contact surface. To reduce the probability that solidified primer layers 96 and 196 adhere to planarization mold 80 the same may be treated with a low surface energy coating 98. Low surface energy coating 98 may be applied using any known process. For example, processing techniques may include chemical vapor deposition method, physical vapor deposition, atomic layer deposition or various other techniques, brazing and the like. In a similar fashion a low surface energy coating (not shown) may be applied to mold 26, shown in FIG. 2. In addition to the aforementioned surfactants and low surface energy coatings, fluorinated additives may be employed to improve release properties of the imprinting material. Fluorinated additives, like surfactants, have a surface energy associated therewith that is lower than a surface energy of the imprinting material. An exemplary process by which to employ the aforementioned fluorinated additive is discussed by Bender et al. in MULTIPLE IMPRINTING IN UV-BASED NANOIMPRINT LITHOGRAPHY:RELATED MATERIAL ISSUES, Microelectronic Engineering pp. 61-62 (2002). The low surface energy of the additive provides the desired release properties to reduce adherence of cross-linked and polymerized imprinting material molds 26 and 80. The embodiments of the present invention described above are exemplary. Many changes and modifications may be made to the disclosure recited above, while remaining within the scope of the invention. For example, the ratio of the components of each of the aforementioned COMPOSITIONs may be varied. The scope of the invention should, therefore, not be limited by the above description, but instead should be determined with reference to the appended claims along with their full scope of equivalents. generating a tertiary group of free radicals by interaction of said plurality of molecules with the free radicals of said secondary group to link together a subset of molecules of said plurality of molecules. 2. The method as recited in claim 1 wherein creating further includes creating said primary group of free radicals by exposing said polymerizable liquid to actinic radiation to initiate linking together of an additional subset of said plurality of molecules. 3. The method as recited in claim 1 further including combining an amine group with a polymerizable composition, with generating further including developing an alpha aminoalkyl radical capable of initiating polymerization. 4. The method as recited in claim 1 further including combining a morpholino group with a polymerizable composition, with generating further including developing a morpholino radical capable of initiating polymerization. 5. The method as recited in claim 1 further including combining an amine group with a polymerizable composition, with generating further including developing an alpha aminoalkyl radical capable of initiating polymerization from said amine group, said amine group being selected from a set of amine groups consisting essentially of 2-Methyl-1[4-(methylthio)phenyl]-2-morpholinopropan-1-one, N-methyldiethanolamine and 2-benzyl-2-dimethylamino-1-(4-morpholinophenyl)-1-butanone and 2-(4-methyl-benzyl)-2-dimethylamino-1-(4-morpholinophenyl)-1-butanone. 6. The method as recited in claim 1 further including forming a composition by combining isobornyl acrylate, n-hexyl acrylate and ethylene glycol diacrylate with an amine group, with generating further including developing an alpha aminoalkyl radical capable of initiating polymerization from said amine group, said amine group being selected from a set of amine groups consisting essentially of 2-Methyl-1[4-(methylthio)phenyl]-2-morpholinopropan-1-one, N-methyldiethanolamine and 2-benzyl-2-dimethylamino-1-(4-morpholinophenyl)-1-butanone and 2-(4-methyl-benzyl)-2-dimethylamino-1-(4-morpholinophenyl)-1-butanone. 7. The method as recited in claim 1 further including forming a composition by combining isobornyl acrylate, n-hexyl acrylate, ethylene glycol diacrylate, a surfactant and an amine group, with generating further including developing an alpha aminoalkyl radical capable of initiating polymerization from said amine group, said amine group being selected from a set of amine groups consisting essentially of 2-Methyl-1[4-(methylthio)phenyl]-2-morpholinopropan-1-one, N-methyldiethanolamine and 2-benzyl-2-dimethylamino-1-(4 morpholinophenyl)-1-butanone and 2-(4-methyl-benzyl)-2-dimethylamino-1-(4-morpholinophenyl)-1-butanone. initiating polymerization of said molecules while minimizing inhibition of polymerization of said molecules by oxygen proximate to said boundary. 9. The method as recited in claim 8 initiating further includes creating a plurality of groups of radicals to link said molecules together, with a first subgroup of said plurality of radicals forming peroxide radicals and a second subgroup of said plurality of radicals being formed from a consumption reaction of said peroxide radicals, with said second subgroup of radicals initiating additional polymerization. 10. The method as recited in claim 8 initiating further includes creating a plurality of groups of radicals to link said molecules together, with a first subgroup of said plurality of radicals forming oxygen radicals and a second subgroup of said plurality of radicals including an oxygen scavenging radical to combine with said oxygen radical before said oxygen radical combines with one of said plurality of molecules. 11. The method as recited in claim 8 wherein initiating further includes exposing said plurality of molecules to actinic radiation. 12. The method as recited in claim 8 wherein initiating further includes creating a primary group of free radicals by exposing said polymerizable liquid to actinic radiation to initiate linking together of said plurality of molecules and forming a secondary group of free radicals by interaction of oxygen in said atmosphere with a subset of the free radicals of said primary group; and generating a tertiary group of free radicals by interaction of said plurality of molecules with the free radicals of said secondary group to link together additional molecules of said plurality of molecules. 13. The method as recited in claim 8 further including combining an amine group with a polymerizable composition, with initiating further including developing an alpha aminoalkyl radical capable of initiating polymerization. 14. The method as recited in claim 8 further including combining an amine group with a polymerizable composition, with initiating further including developing an alpha aminoalkyl radical capable of initiating polymerization from said amine group, said amine group being selected from a set of amine groups consisting essentially of 2-Methyl-1[4-(methylthio)phenyl]-2-morpholinopropan-1-one, N-methyldiethanolamine, 2-benzyl-2-dimethylamino-1-(4-morpholinophenyl)-1-butanone and 2-(4-methyl-benzyl)-2-dimethylamino-1-(4-morpholinophenyl)-1-butanone. 15. The method as recited in claim 14 wherein combining further includes providing said polymerizable composition with a surfactant. accelerating linking of said plurality of molecules by creating additional radicals through combining said photoinitiators with oxygen. 17. The method as recited in claim 16 wherein accelerating further includes creating a plurality of groups of radicals to link said molecules together, with a first subgroup of said plurality of radicals forming oxygen radicals and a second subgroup of said plurality of radicals including an oxygen scavenging radical to combine with said oxygen radical. 18. The method as recited in claim 16 accelerating further includes creating a plurality of groups of radicals to link said molecules together, with a first subgroup of said plurality of radicals forming oxygen radicals and a second subgroup of said plurality of radicals including an oxygen scavenging radical to combine with said oxygen radical before said oxygen radical combines with one of said plurality of molecules. 19. The method as recited in claim 16 wherein accelerating further includes creating a primary group of free radicals by exposing said polymerizable liquid to actinic radiation to initiate linking together of said plurality of molecules and forming a secondary group of free radicals by interaction of oxygen in said atmosphere with a subset of the free radicals of said primary group; and generating a tertiary group of free radicals by interaction of said plurality of molecules with the free radicals of said secondary group to link together additional molecules of said plurality of molecules. 20. The method as recited in claim 16 further including combining an amine group with said plurality of molecules, with accelerating further including developing an alpha aminoalkyl radical capable of initiating polymerization. 21. The method as recited in claim 16 further including combining an amine group with said plurality of molecules, with accelerating further including developing an alpha aminoalkyl radical capable of initiating polymerization from said amine group, said amine group being selected from a set of amine groups consisting essentially of 2-Methyl-1[4-(methylthio)phenyl]-2-morpholinopropan-1-one, N-methyldiethanolamine, 2-benzyl-2-dimethylamino-1-(4-morpholinophenyl)-1-butanone and 2-(4-methyl-benzyl)-2-dimethylamino-1-(4-morpholinophenyl)-1-butanone. 22. The method as recited in claim 21 further including combining a surfactant with said plurality of molecules. exposing said composition to actinic radiation. 24. The method as recited in claim 23 wherein combining further includes adding a surfactant. 25. The method as recited in claim 24 wherein combining further includes generating said oxygen scavenging initiator by providing an amine group, selected from a set of amine groups consisting essentially of 2-Methyl-1[4-(methylthio)phenyl]-2-morpholinopropan-1-one, N-methyldiethanolamine and 2-benzyl-2-dimethylamino-1-(4-morpholinophenyl)-1-butanone and 2-(4-methyl-benzyl)-2-dimethylamino-1-(4-morpholinophenyl)-1-butanone. a polymerizable composition including a photoinitiator and an oxygen scavenging element to react with oxygen and facilitate cross-linking of said plurality of molecules. 27. The composition as recited in claim 26 wherein said oxygen scavenging element is an amine group selected from a set of amine groups consisting essentially of 2-Methyl-1[4-(methylthio)phenyl]-2-morpholinopropan-1-one, N-methyldiethanolamine and 2-benzyl-2-dimethylamino-1-(4-morpholinophenyl)-1-butanone and 2-(4-methyl-benzyl)-2-dimethylamino-1-(4-morpholinophenyl)-1-butanone. 28. The composition as recited in claim 26 wherein said polymerizable composition further includes isobornyl acrylate n-hexyl acrylate ethylene glycol diacrylate 2-hydroxy-2-methyl-1-phenyl-propan-1-one. 29. 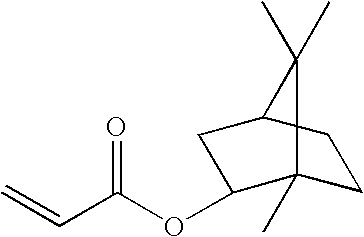 The composition as recited in claim 26 wherein said polymerizable composition further includes isobornyl acrylate n-hexyl acrylate ethylene glycol diacrylate 2-hydroxy-2-methyl-1-phenyl-propan-1-one, and R1CH2CH2O(CH2CH2O)XH. isobornyl acrylate n-hexyl acrylate ethylene glycol diacrylate 2-hydroxy-2-methyl-1-phenyl-propan-1-one and an oxygen scavenging element to react with oxygen and facilitate cross-linking of said plurality of molecules. 31. The composition as recited in claim 30 wherein said oxygen scavenging element is an amine group selected from a set of amine groups consisting essentially of 2-Methyl-1[4-(methylthio)phenyl]-2-morpholinopropan-1-one, N-methyldiethanolamine and 2-benzyl-2-dimethylamino-1-(4-morpholinophenyl)-1-butanone and 2-(4-methyl-benzyl)-2-dimethylamino-1-(4-morpholinophenyl)-1-butanone. isobornyl acrylate n-hexyl acrylate ethylene glycol diacrylate 2-hydroxy-2-methyl-1-phenyl-propan-1-one, R1CH2CH2O(CH2CH2O)XH and an oxygen scavenging element to react with oxygen and facilitate cross-linking of said plurality of molecules. 33. The composition as recited in claim 31 wherein said oxygen scavenging element is an amine group selected from a set of amine groups consisting essentially of 2-Methyl-1[4-(methylthio)phenyl]-2-morpholinopropan-1-one, N-methyldiethanolamine and 2-benzyl-2-dimethylamino-1-(4-morpholinophenyl)-1-butanone and 2-(4-methyl-benzyl)-2-dimethylamino-1-(4-morpholinophenyl)-1-butanone. US4544572B1 (en) 1982-09-07 1994-01-04 Signet Armorlite, Inc.
FR2693727B1 (en) * 1992-07-20 1994-08-19 Ceramiques Tech Soc D Polycondensate organomineral and production process.